Students soon discover the value of another language, not only in providing greater employment and career opportunities, but also in providing different insights, a fuller and richer perspective on different cultures, academic disciplines, and, in fact, on all aspects of life. The Department of Modern Languages, Literatures and Cultures is the choice of students who enjoy learning about other languages and cultures and who realize the importance of communication in all aspects of contemporary life. Why study Modern Languages at Bishop’s? Bishop’s constitutes a cultural crossroads. Its setting in a predominantly anglophone community in the middle of francophone Quebec provides our students with exposure to both major linguistic and cultural groups in Quebec, while its diverse student population–drawn from all parts of Quebec, Canada, the United States, and abroad–assures a vibrant interchange between students of different cultural and linguistic backgrounds. The Bishop’s environment is ideal for language acquisition. Small class size encourages an excellent rapport between teachers and students, as well as superb opportunities for learning and practice. Bishop’s small size overall fosters a close interaction amongst the various faculties, making interdisciplinary studies an exciting possibility. Thus, students may decide to specialize in one, two, or even three languages, or combine their language studies with concentrations in other disciplines like music, philosophy, business or science. There are other attractive features. Each section of the Department has various extra-curricular activities: conversation clubs, guest speakers, field trips, and cultural events. The library also holds a wide selection of journals, books, tapes, CDs and CD-ROMS and films in all the major languages. Bishop’s has a well-developed international exchange program, which permits students to go abroad to perfect their knowledge of language and culture and fill concentration requirements. In terms of official certification, Bishop’s hosts international exams in German (Zertifikat Deutsch) and Spanish (Diplomas de Español Lengua Extranjera). The Department of Modern Languages offers Majors in Modern Languages and Hispanic Studies, an International Major in German Studies, as well as Minors in German Studies, Hispanic Studies, and Japanese Studies and Certificates in Modern Languages and in Intensive English. The Major in Modern Languages consists of 60 credits equally distributed (30/30) between two languages Concentrations chosen from German, Japanese, and Spanish (Hispanic Studies). Students may also complete one of their two language Concentrations in English Language Studies (for non-native English speakers) or French (offered by the Département des études françaises et québécoises). The Major in Hispanic Studies and the International Major in German require 42 credits, and minor concentrations require 24 credits. The Certificate in Modern Languages provides students with a working knowledge of at least two of the modern languages taught at Bishop’s University: English, French, German, Japanese, and/or Spanish. 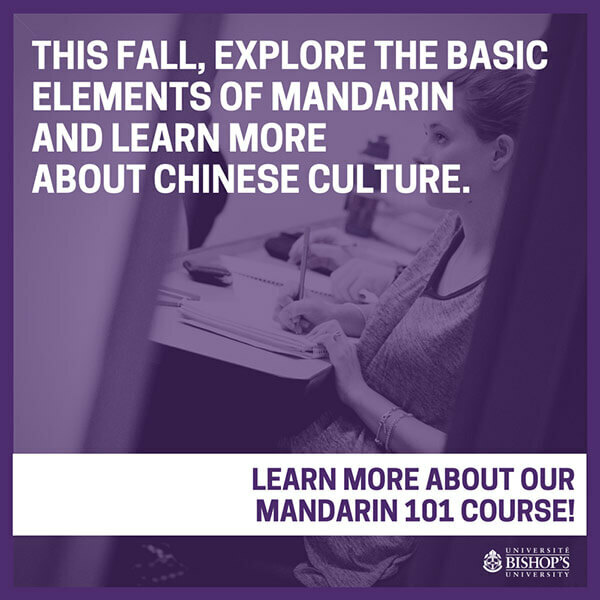 Students must complete a total of 10 courses (30 credits) with at least 4 courses (12 credits) in each of two main languages. The 6 remaining credits may be taken in either of these two main languages, or in one other language. The Certificate in Intensive English (30 credits/ 15 credits per term) allows students to make rapid progress in the acquisition of English (control groups have improved from low intermediate to advanced level in one semester of study).